Space shuttle Discovery is prepared for its final launch into space, which is scheduled for Nov. 1, 2010 from the Kennedy Space Center in Cape Canaveral, Fla. This storywas updated at 10:45 a.m. EDT. CAPE CANAVERAL, Fla. ? 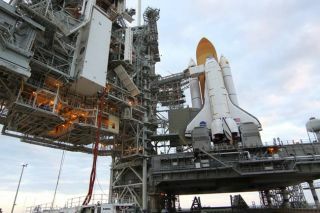 The final launch of the space shuttleDiscovery has been delayed another 24 hours ? to Nov. 3 ? to allow engineers more time to address troublesome leaks that were found on the orbiter lateThursday (Oct. 28). Engineers have been scrambling to fix leakyhelium and nitrogen seals in one of Discovery's twin aft-mounted enginepods. The leaks are in seals used to pressurize fuel line plumbing in one ofthe shuttle's orbital maneuvering system pods. NASA managers met this morning and made the decision todelay the shuttle's launch, after it was deemed impossible to meet Tuesday'swindow. The Nov. 3 liftoff is now targeted for 3:52 p.m. EDT (1952 GMT). Technicians here at Kennedy Space Center in Cape Canaveral,Fla. worked overnight to complete repairs, and made good progress, but areslightly behind the timeline that was prepared yesterday, NASA test directorJeff Spaulding told reporters in a status briefing this morning (Oct. 30). "As we went through the day yesterday, we found thatthere were additional things we needed to do," Spaulding said. "Therewas quite a bit more work we needed to do from a leak check perspective. As aresult of that, we're a bit down on our timelines." The necessary repairs and replacements have been made to thefaulty seals, but shuttle technicians will need to work throughout the day andnight to re-pressurize Discovery's orbital maneuvering system rocket engine. Discovery has until Sunday, Nov. 7, to launch in the currentwindow, Spaulding said, which "gives us five days of attempts to get offthe ground." On its 11-day mission, Discovery will haul critical spareparts to the space station, including a storage room and a humanoidrobot to assist the crew of the orbiting laboratory. Discovery'sfinal flight will be NASA's 133rd shuttle mission, before the space agencybrings its 30-year space shuttle program to a close in 2011. NASA will retire the three remaining shuttles in its fleet ?Discovery, Atlantis and Endeavour ? next year to make way for a new plan aimedat sending astronauts to visit an asteroid and Mars. Discovery is the oldest ofNASA's space shuttles. President Obama recently signed a major NASA act that turnshis vision for U.S. space exploration into law. The NASAauthorization act scraps the space agency's previous moon-oriented goal andpaves the way for a manned mission to an asteroid by 2025. A manned mission toMars is envisioned for some time in the 2030s. The bill also calls for a budget of $19 billion for NASA in2011, adding one extra space shuttle flight before the fleet retires next year,and the extension of the International Space Station through at least 2020. Follow SPACE.com Staff WriterDenise Chow on Twitter @denisechow asshe covers Discovery's final space voyage from Cape Canaveral, Fla. Click here formission updates, new stories and a link to NASA's live webcast coverage.